“As with any day in the Lakes, the enjoyment of the 16 ½ mile... stage depends largely on the weather.” So says THE BOOK before going on to point out that we will be walking through the area around Sprinkling Tarn today, the place with the highest annual rainfall in England. Luckily the sun is shining when we wake up. On in the present, then, we slot into the moving caravan of walkers setting off from the other B & B’s all around the same time. With our first hotel packed lunch stowed in Ray’s rucksack (Mars Bars included) we are ready for the day. Even the legs have been surprised into activity. Its not long before we have caught up with Australian Jenny, from yesterday. Later, when we get to the Lake, we all take the South side, as per the route, even though we have been told there is an easier path around the North side. The path on the South side is rough underfoot, and there is no time to take your eyes off of your feet.. unless you want to end up IN the lake. It undulates and crosses many small streams. The weather is good for walking. Cloudy with sunny spells. All is going quite well until we hit the feature known as Robin Hoods Chair, where the path becomes a definite scramble. I have to haul myself up, quickly before panic sets in and renders my feet useless, and come down just as quickly using my bottom. Didn’t like that at all. This is just the sort of thing that goes through your brain on a loop, as you walk comfortably along looking at the part paved path. Two further verses come to me as we continue. I don’t need many baths. In spite of such entertainments we do eventually get to the end of the lake, stop for a snack, and then continue after crossing the River Liza, up an endless forest track towards the Black Sail Youth Hostel. This track is definitely endless, and in spite of the views, and the company of the U3A’s towards the end, just a bit, well… boring. No matter. I can do boring. Its better than scared on the whole. FINALLY. The trees thin out, and we can see the end of the valley we will be climbing out of. 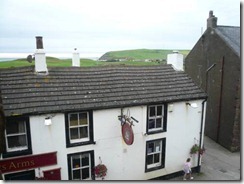 By the time we get to Black Sail we are well ready for lunch. As is everyone else, and although its quiet when we get there, it soon becomes something of a motorway service area. At least, one without any facilites or toilets. (Toilets only open after 5.00 due to small septic tank. All females are disappointed by this). As one of the first there we get the wooden bench for our lunch. Its tidy. No one lingers long here. As no one knows what lies ahead you feel that you must press on. Anyway, its pretty obvious, even without reading about it, that we are in for a good bit of ‘up’. There are several paths leading on here and our path is surprisingly a very thin looking affair going off to the left over the drumlins. It continues to feel like an unlikely choice until after we cross a stream, and then a paved path ascends steeply, at first up a small ridge, but then by winding its way over steeply stepped boulders, ever upwards towards the skyline. Its every man for himself going up here. “Just like the bloody Inca Trail,” mutters one woman as we puff our way past. “Really?” I ask. “Yes. Except that was at altitude and went on for days!” I mentally cross that one off of my ‘likely to do list’. Oh well. As ever with these things, there are several moments when you think you’ve got it in the bag. The worst is over. There’s the top. 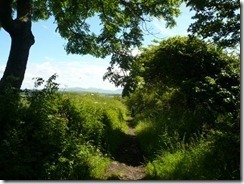 Only to find that around the next turn you can see the path beyond, still cheerfully heading on up. It IS great when you do get over the crest, however. Beyond a boggy field and over a stile you are rewarded with a view over TWO lakes, or is it THREE? There is Ennerdale Water. It seems a long way off now. 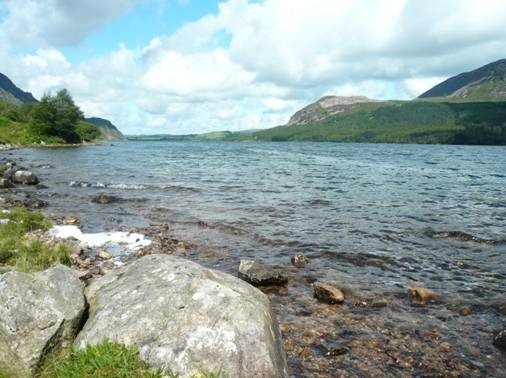 Whilst over to the right you can see Buttermere, being Buttermere and Crummock Water. Yep. Three it is. 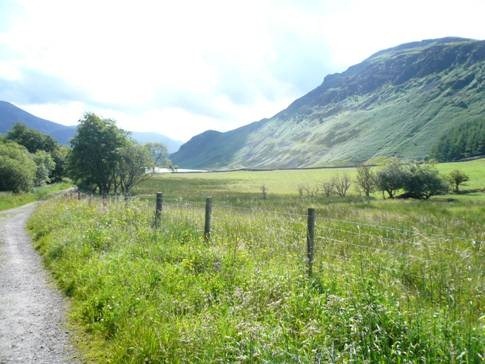 The path continues, at first a little indistinctly, but the as we see over the pass we notice the medical students with their outrageously large rucksacks in the far distance. This rocky traverse is Grey Knotts, and soon we can also see the ruins of the top of a tramway which carried slate down towards the Honister Pass. Although not much remains, you can see that it was a house like structure, and is known as Drum House. The tramway cable was apparently held here. From here the path is obvious, loose and rocky underfoot, and unrelentingly steeply down. In later days some folk referred back to this path in reverence, as a kind of measure of unpleasantness. I can’t say I noticed it much, myself. Probably because down below, somewhere, there lies the Honister Slate Mine Visitors Centre, and whatever part of my mind was not concentrating on my feet, was absorbed with the very important idea of …TEA…in cups!... and a toilet…. In such a way are many meaningful moments and fantastic views etc lost to consciousness. Hmmm..
And when we finally got there the place did indeed live up to its promise, although what else was going on there, or what the exhibition held, I could not say, being focussed solely on instant gratification. Sadly we didn’t have room for an ice cream after the large cakes. By the time we left the Slate Mine the weather had closed in a little. Some of that predicted rain looked to be on the cards. The rest is mostly down. Down the road. Down a lovely path. Down towards Seatoller, where we catch up with the Med Students again. Those poor boys look well tired. One of them is limping a bit and in fact we don’t see them again on the entire trip. 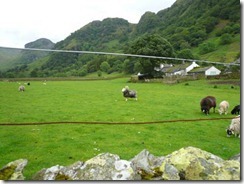 Maybe they decided to stay in the Lake District. After the pretty little “National Trust village of Seatoller”, and a tearoom opportunity spurned (Too full, still. Damn.) 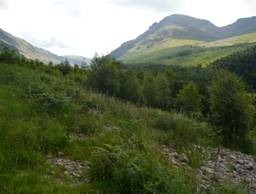 we meander along the valley through Johhny Wood, and passing a part where you have to cling on to some thoughtfully placed chains welded into the rock, to stop you slipping into the river. 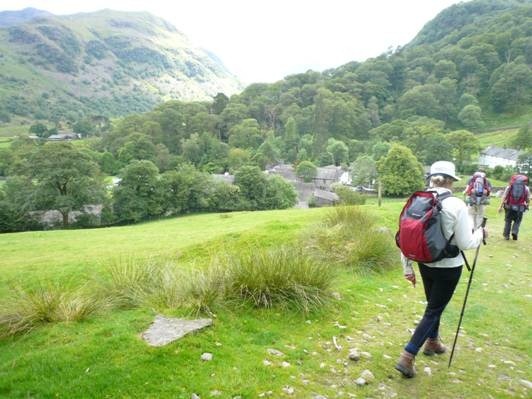 We are nearly into Longthwaite, the first of the three interlinked Borrowdale villages, when Ray announces a ‘little detour’. Not for us the short cut to Stonethwaite, then, location of B&B number three. 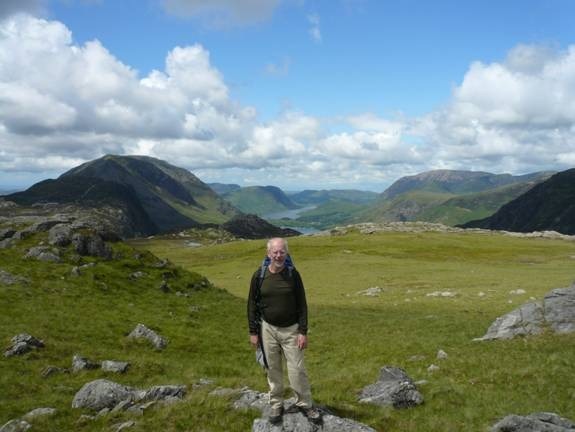 He has a yen to see the Borrowdale Youth Hostel, and the Scafell Hotel in Rosthwaite, where he and the Stourbridge crew spent a New Year in 1970something or other. Well. I suppose its unlikely we will be back in the short term, so why not. 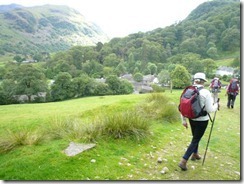 At least we can say we have seen Borrowdale… All of it. Onwards the oldies!! The youth Hostel is a disappointment. 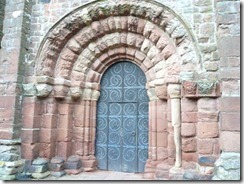 It looks as though its been rebuilt, and fails to ring any bells. There’s a most interesting bridge, however, with many kinds of moss. 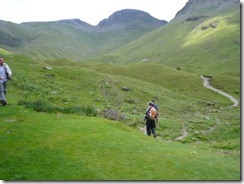 The traverse through the villages is lovely, and the Scafell Arms looks the same. Job done. Only then do we have to turn out the waterproofs as a sudden shower necessarily arrives to uphold the area’s rainfall record. Their FIRST appearance!! 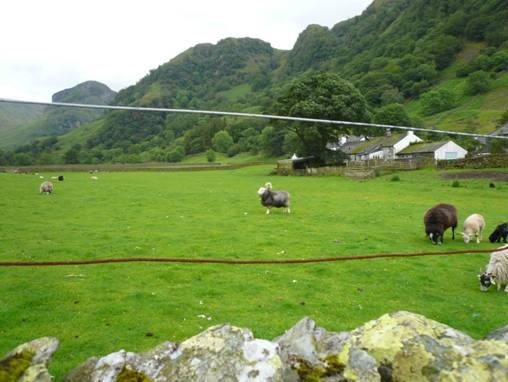 Stonethwaite is ashort distance further on along the river, over an old bridge, past a field of speciality sheep, some of which are Herdwicks. The farm we are staying in tonight is a very old thickly walled affair, with customary barking dog on arrival (but never actually seen). The room is small but perfectly formed and beautifully decorated. 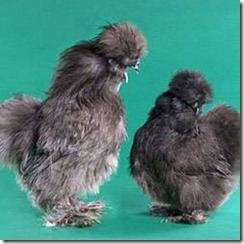 Outside our window are a pair of bizarre chicken, which turn out to be blue silkies when I ask the landlady later. 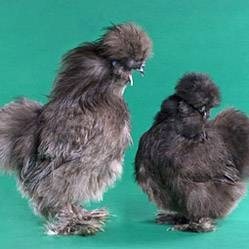 The female in particular looks like a cross between a chicken and a grey poodle. 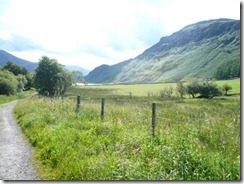 Just up the road is the Langstrath Inn, where we have booked to eat tonight. This proves to have been a genius move. It is a really olde worlde place, with a fantastic line in food. When we turn up people have to be ejected from our reserved table, it is full. We feast on Braised Herdwick Shoulder of Lamb in Red Wine Sauce. The BEST I have ever tasted by leagues. Followed by the ultimate Sticky Toffee pudding, of unsurpassed stikyness and toffeeness. 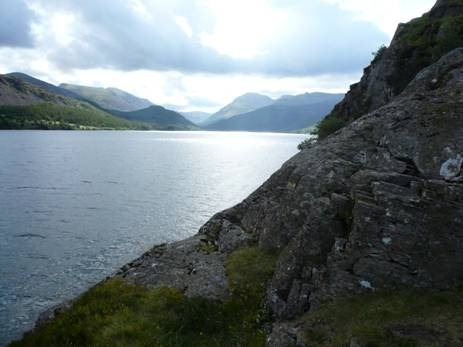 Lakeland Bliss. Pull the curtains back. Amazing. It looks like a good day. Ah. The first cooked breakfast. A communal table in a cheerful room. 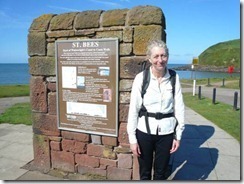 Another walker who completed day one yesterday, but had to come back to St Bees for accommodation. He has left his car here at the B&B for a week. The first day was tough he tells us, but we should be OK. Mind you he met an Australian who vastly underestimated the undertaking and had had enough after the first walk. At least he survived day one I think to myself. Next the two medical students appear. They are staying here as well. They don’t seem so nerdy this morning. This is a part of the Coast to Coast experience, where people appear and disappear, to reappear several days later, either on the trail or in accommodation somewhere. Once you realise you are not going to see the same people all the time, or every day, this is actually quite a plus. Its sociable and friendly – even encouraging – without being claustrophobic. Walking kit on. Suitcases carried down to the hallway. We’re off. At least as far as the Post Office Store which apparently does a great line in pies. This proves to be the case, as the man behind the counter reels off a list of about 10 varieties. Suitably pied up we progress the mile to the sea where a coach party of OAPs is either getting off or onto a coach, and people are walking dogs. Although small, this part of the village definitely has that cool early morning seaside town feel. Its going to be a hot day. We are supposed to dip our boots in the sea, but its not easy. The tide is in and the concrete lifeboat launch area is a bit slippery. Ray scrapes his knee getting off it. We can’t have injuries before we’ve even started, so the boot dipping is done gingerly and I forget the necessary pebble. Over by the zero mile marker the two students are trying to get their results. 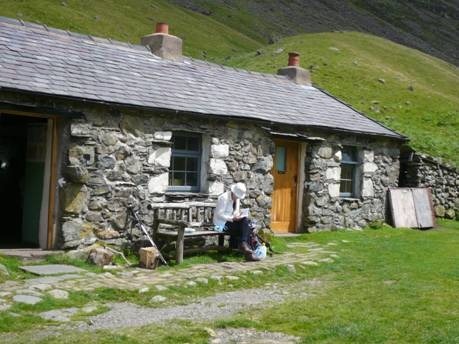 There won’t be much mobile signal today, or in fact for the next two days. Picture by the sign and away. “Have you just finished?” Asks a fellow we shall meet again over the next 17 days. “Do I look as if I have?” Ray responds. They’re probably about our age, but his wife is wearing a turquoise fringed beach dress and looks as if she’s on holiday in Spain. Just shows how looks can be deceptive as we meet them again at several points during the morning. They’re obviously doing “it” too, but no one wants to give too much away. 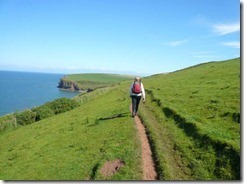 A short distance up the cliff path we meet the first path divide. This is not mentioned in the book. Rather unwillingly I go with Ray’s choice. He is of course correct, and I have to make sure I go with his choice now over the next few weeks. A lesson learnt. 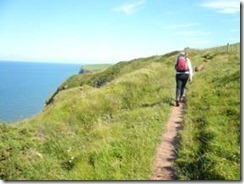 The coast path is a bit like Devon (red sandstone cliffs), a bit like the Pembrokeshire Coast Path (up and down). 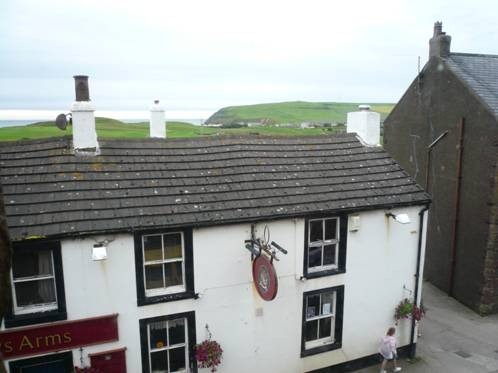 Views behind over St Bees, and as we continue, to Scotland and even the Isle of Man. In a short while we descend again to Fleswick Bay (optional, but has to be done of course) so I can pick up some pebbles here. I get several small red mottled ones. The bay is beautiful. Well worth the stop, though questions about how long we are taking, and will I be able to get to Ennerdale Bridge, flutter on the edge of concentration. That can’t be right. This is a walk, and we don’t have to rush. Long as we are there before 8 o’clock. I don’t think I could walk that long anyway. Questions such as these can only be answered by doing this. There are a few bird watching points. Ray has brought the old binos. 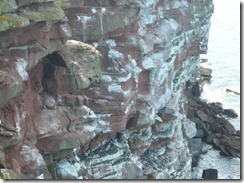 We are supposed to see black guillemots, but only manage ordinary guillemots, razorbills and seagull chicks. Time to get on. We pass the coastguard lookout and the lighthouse. Its getting hot and feels as if we have been walking for hours already. Two silent men pass. They sound Spanish or Italian. The only two of many here today who don’t seem cheerful. Whitehaven comes into view and we at last turn away from the coast. Are we going East yet? Not sure. A transit type van collecting rubbish comes up the lane towards us. It is so narrow we have to climb up into the hedge to get past. On to the first village, Sandwith. Amazingly the village pub is still not open. But then it is before 11.00, so we have hardly been walking for 2 hours yet. It seems a lot longer. 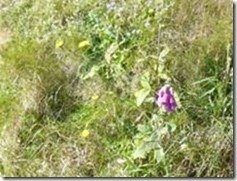 After Sandwith through farmland, some of which would be boggy were it not that everywhere seems dry underfoot. Our first sheep. Dear old sheep. So quiet and reliable. Over a little stream, under a railway tunnel on to the Sustrans bike path – a disused railway. By now it is well hot, and past what feels like stopping time. I am sweaty and tired, maybe grumpy, though of course, haven’t said so. The cycle track seems to go on and on, and it feels as if we are doing some unnecessary extra distance to Moor Row. 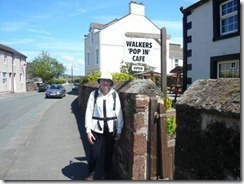 Coming up off the track we are on the lookout for the Walker’s Pop In Café, as recommended by the bloke at breakfast. Yay. There it is. A woman has converted her front garden into a little business offering teas, cakes and sandwiches for a pittance. Perfectly ordinary woman. I have the overwhelming feeling, however, that she is running a social service here. It is all I can do to stop myself hugging her. It feels like an oasis in a desert, replete with toilet. I write as much in the visitors book which we have to sign. As with elsewhere on the route, it is full of Australian entries. Really, that was the hard point of the day over. Actually it wasn’t of course, but I didn’t feel as desperate as that again anywhere on the trip. Some kind of mental or physical barrier had been crossed. This is what we are going to be doing, and this is how it is going to be. Fine then. OK. In a short while we are in Cleator, a mining village that gets a poor press from Wainwright and other Coast to Coast literature. But today the sun is shining and Cleator looks fine. 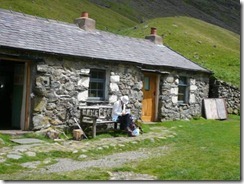 Its even got a shop, and a view of Dent Hill , our next goal. It looks semi tree clad and not too bad from the Cleator perspective. However, when we start climbing, (just after going through a farmyard without barking dogs but with a smiling farmer who predicts good weather for at least three days) it is definitely steep, and the trees which I had hoped would provide cooling shade provide only hot trapped air and muddy paths. We stagger on upwards out of the trees, stopping on the open grassy slope to “admire the view”, but really to get our breath back. Although the views are indeed fantastic. We can see the Scottish coast reaching out into the Irish Sea, the Isle of Man, and in the other direction the hills of the Lake District, a little dark and forbidding where the sun is not shining on them. You can also see Sellafield should it interest you. After that struggle up, it must get easier. 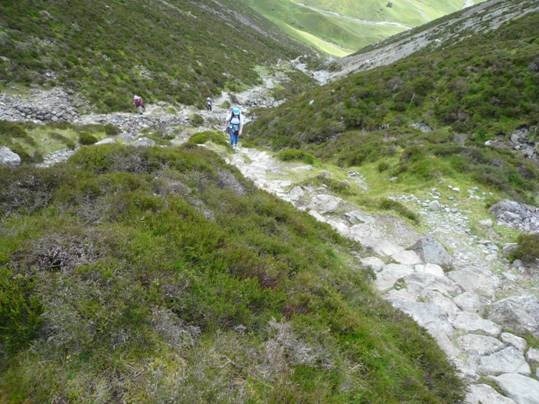 Well as every walker knows, yes.. and no.. What goes up has to deal with knee pain on the descent, and descending takes longer unless you are able and willing to take the kamikaze approach. We have a 14 foot deer style to climb over which effortlessly activates my panic response when going over the top. Just how high can deer jump for goodness sake? 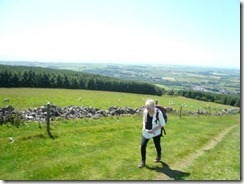 Followed by “one of the steepest descents on the entire walk” allegedly. Raven Crag - a grassy path, a slow and painful loss of the height we struggled up such a short time ago. At one point my total concentration on every footstep is deflected by what sounds like some kind of steam driven engine or bellows. Looking up, (don’t move the feet now) almost next to me is a scantily clad heavily breathing fell runner coming UP this ridiculous path. You can only stare in wonder. I give him a round of sincere applause, acknowledged by a slight rictus. It is now going on for 4 o’clock, and time for lunch!! 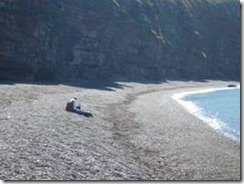 Where are those St Bees pies? They are absolutely delicious and disappear in seconds sat by a stream in a beautiful steep sided enclosed probably limestone valley going by the glorious name of Nannycatch Gate. Fuelled by pie we have cracked it. 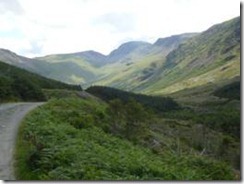 Up gently over common grazing land and down the longish road to Ennerdale Bridge, a lovely little Lakeland village where we check in to the Shepherds Arms. Boots off in the hall. Haul the suitcases upstairs. Shower and collapse into bed. It must be 5 o’clock. Quite a long day, but we made it here! Later, whilst seeking pre dinner beer, we get into conversation with Glyn, a retired food technology expert who spent his working life establishing Waggon Wheel factories in the far flung corners of the globe. He is here with the Peterborough branch of the U3A (University of the Third Age). He is sociable in that way of people used to travelling alone, and wants to know about us. This is most unusual in our normal circles, but we are on holiday after all, we can cope. Whatever. There will be no need for an evening stroll tonight! Set off from Llanelli with the usual chaos and anxiety of lost taxi. (They always stop at the bottom off the hill). Two phone calls and much pacing by the gate later, we eventually get to the station with a few minutes to spare. It begins to dawn on us that the suitcases are 1. Large and 2. Heavy. It takes some doing to get them on the train and into a luggage rack at the end of the carriage. After that… GREAT... Straight through to Crewe. Pleasant train. Space. Nice morning. 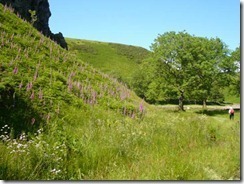 Wales looks lovely as we speed almost silently through Cwmbran (never been there before), Abergavenny, and border towns. Crewe is hot and we have the suitcases to cope with again. There are loads of people waiting for our train on the platform, but it will be fine won’t it. We’ve got reserved seats… Yeah right but someone’s luggage is already in them. Modern trains do not have space for normal sized suitcases. I cuddle my suitcase all the way to Carlisle. Somehow on the 2 hour journey Virgin Trains lose 25 minutes, although they don’t tell anyone, so that we miss our connection. Carlisle station is unmistakeably northern. Why? Not sure, but its stones are dark grey. The weather has turned to rain clouds. It is busy and very long goods trains keep passing through noisily clanking in both directions. There is a separate platform area for the Settle to Carlisle trains (maybe we should have thought if coming that way), and another separate platform area for the Cumbrian Coast route that we will have to take. There is a buffet with tables on the platform, all a little uncared for. We decline the buffet scones as quite a few flies seem to have got there first. A lady is looking for someone to hold her large enthusiastic dog while she goes to get a cup of tea. Luckily she does not choose me. Enormous fast trains with 4 or 5 First Class coaches apiece slide in and out on their way between Edinburgh/Glasgow and London. Ray goes over the large footbridge/ramp to explore. There is no ticket barrier. You can just walk out into a litter strewn square with a castle. A poster advertises “The Famous” Carlisle Railway Station Ghost Tours. Without announcement we become aware through psychic presentment that our train is there. It is one of the busy trains of the day. School children, shopping returnees, people leaving work at 5.00. We pick them all up and drop them off as the train heads first north west, and then turns south to run along the Cumbrian Coast. The little stations have excitingly northern names, Dalston, Wigton, Aspatria (what was that again?). We are really somewhere different now. We’re on holiday. 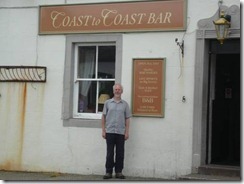 We reach the coast at Maryport. Flimby, Workington, Parton, Whitehaven. Unfortunately its still quite grey and unfriendly outside. 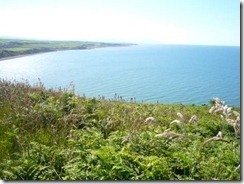 There is an enormous windfarm, and in the distance can be seen the coast of Galloway and Dumfries. My god. Scotland. We are a long way North!! I am surprised how flat the scenery is since we are supposed to be starting the walk tomorrow on a cliff path. Whitehaven seems to be a prettier town though, and shortly after we plunge through a tunnel to emerge in a lovely little village station. St Bees. It looks promising. Fairladies Barn, our first B&B, is a long way UP a main street, past the Post Office Stores, the Coast to Coast Bar, and a couple of pubs. The suitcase dragging is not the best, and Ray has to carry his. “Its easier to wheel it!” advises a cheerful child cyclist. 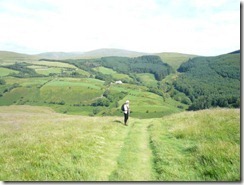 Thus we are introduced to a feature of the walk… everyone speaks to you. Later that evening, after we have checked in to the friendly but slightly ramshackle accommodation, wrestled the suitcases up the first of many awkward staircases, noted the view of St Bees head from our room, and headed out again in search of food, everyone we meet has a cheery “Good evening” or “Hello” to share with us. 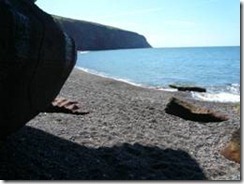 St Bees. What a lovely little village. Handsome houses. Quite large. Not really rural. Set back quite a way from the sea. A group of probably girl guides are out playing rounders on the village field with Arkela or whoever it is. A quick Hiya to the statue of St Bega (alleged Irish princess/ seafaring hermit and local good egg). A wave to the1583 Grammar School. 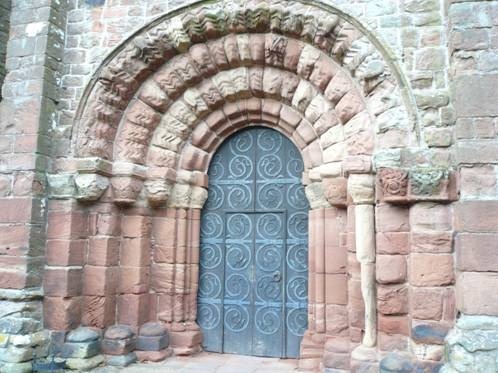 A visit to the church… red sandstone, Norman entrance, and, again a feature of the trip…, OPEN , even though its now about 7 o’clock on a Monday night. It is well lit. Well cared for. 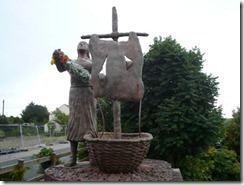 There’s a history of the Church and the Village, all well presented. Interesting. Feels like a real community. It is hard to fit in eating but we do our best, stopping in the Queen’s Head for a pint of Jennings Bitter and a Chicken and Leek pie. During the meal yet another trip feature presents itself. Other walkers. Across the pub restaurant two enthusiastic and slightly nerdy young men have seized on a red faced loner who it seems has finished the walk this very night, in the east to west direction. There is much talk of what has been done before by the young men. General talk about what is to come, which personally I would rather not hear, although its very difficult not to listen. Mention is made of, was that right, “Swansea”. Then I’m sure I heard “medicine”. Make a mental note to tell Ray when we get a quiet 5 minutes. However, events take over when as we pay for the meal they rush up enthusiastically to Ray. “Are you one of the Lecturers at Swansea Medical School?? ?” It transpires that they are getting their final results tomorrow, and are doing the walk with camping gear. So far and yet so near it seems. We have forgotten the alarm clock. Set the mobile for 7.15. (It stays at that time for the rest of the trip.) Sort out the walking gear. Repack the suitcase ready for the off.